As you may have already read, Detroit Lions first round draft pick Riley Reiff played a season-high 22 snaps against the Philadelphia Eagles on Sunday. Actually, he was on the field for 25 plays, but three were erased by penalties. • He played 17 first down plays, five second down snaps and was out there on third down situations twice, including the Lions' final offensive snap in overtime. • The Lions ran the ball 17 times and passed just five while Reiff was on the field. • Reiff lined up on the right side of the line 16 times and on the left nine times. It was more balanced in the first half, but in the second half, he was on the right side of the alignment eight times compared to just once on the left end. • The Lions had 14 effective gains and eight non-effective plays, including a couple short-yardage situations. Although the result of the play was ineffective, Reiff and the offensive line provided excellent pass protection on the deep pass Titus Young dropped. 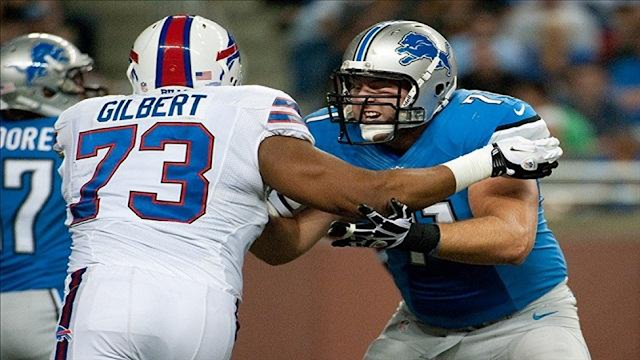 • Overall, on the 22 plays Reiff was on the field, the Lions gained 155 yards. That's 7.0 yards per play. Included in that total were eight plays of 10 or more yards. As for his individual play, Reiff was impressive, particularly in the way he handled Eagles defensive end Jason Babin, one of the best edge rushers in the NFL. Admittedly, Babin is average against the run, but Reiff got excellent push all day, moving the veteran defensive end all over the field, taking him to the ground on multiple occasions. Reiff also showed good ability to get to the second level, whether coming straight off the line, or peeling off one block to get to another. We didn't get to see a lot of Reiff in one-on-one pass blocking situations. The Lions effectively used tight end Will Heller on chip blocks twice, lessening the responsibility of Reiff on those plays. On a third snap, the Eagles rushed three, all on the opposite side of the offensive line, leaving Reiff with no blocking assignment. On the two plays where Reiff did have one-on-one responsibilities in pass protection, he was solid. He controlled Babin on a 1st-and-10 play in the fourth quarter that resulted in a 36-yard completion to Calvin Johnson. Also, at the end of the first quarter, after quarterback Matthew Stafford failed to find an open receiver on his initial run through his reads, Reiff was able to stay in front of defensive end Brandon Graham, allowing Stafford to roll out of the pocket and extend the play. The quarterback eventually found Mikel Leshoure for a 12-yard gain.